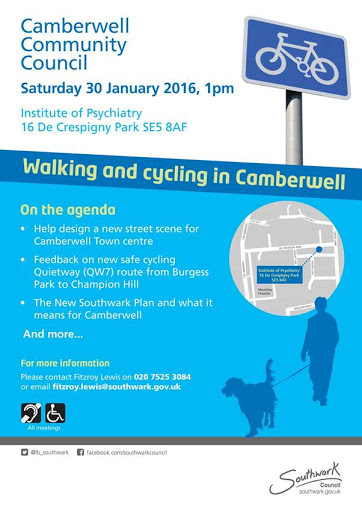 This Saturday, 30 January 2016, Camberwell Community Council will be discussing walking and cycling. Join the meeting at 1pm at the Institute of Psychiatry, De Crespigny Park, SE5 8AF to help make Camberwelll better for walking and cycling. Camberwell straddles both Lambeth and Southwark and whilst Camberwell town centre is in Southwark around 25% of the SE5 area is in Lambeth and many of us visit or pass through Camberwell regularly including many children who cycle through Camberwell en route to schools in Southwark. Currently Camberwell town centre is cycle and pedestrian unfriendly with a six lane urban motorway running through the area, dangerous turnings such as that into Orpheus Street and a lack of dedicated cycle facilities. Crowded pavements and dangerous roads making walking hard too. It could be so much better and this meeting is a chance to help Southwark make Camberwell more people friendly.